From getting his start as a b-boy (break dancing boy) in the rugged streets of New York to becoming a renowned artist and USC art teacher, Justin Bua has made his style known to the world, using urban elements and blunt realism to reveal a unique, multicultural interpretation of life. called hip-hop, spending most of his time out in the streets. "People have a nostalgic feeling of growing up in the city, but in all reality, it was pretty harsh," he begins. "There were a lot of homeless people." But Bua still found enjoyment despite the unpleasantness of the city. "It was incredibly exciting in a moment when I was bored. I could walk down the street and be entertained." Bua's first artwork began with the encouragement of his mother and grandfather. "My grandfather and mom were artists, so it is kind of in my family." His love for art eventually landed him in the High School of Music and Performing Arts at the age of 13. The private institution allowed Bua to begin honing his art skills. "In New York, if you have to go through the public school, it's pretty bad," he states, looking back at his childhood. But Bua still had his first love, b-boying, and the school was just another way for Bua to show off his breakin' moves. "At the time, (hip-hop artist) Slick Rick was in my school. So he rapped and I popped in the lunchroom." With hip-hop literally in its baby stages, Bua witnessed firsthand the development of the culture. "I remember when everyone used to do all the elements," he states. Bua himself was dabbling in graffiti at the time as well. He says,"I was more of a b-boy than a graffiti artist. Art was my steez (style), and graffiti was an element that I wanted to be good at, but I just wasn't." 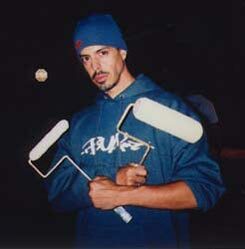 B-boying led Bua to The New York Express, a professional breakin' crew that was hitting up world tours. But his love for the dance aesthetic in hip-hop was slowing down. "After I stopped touring with my crew," he says, "I decided to stop breaking." Bua went back to the drawing board, getting accepted to Hampshire College in Massachusetts. But Bua didn't find what he was looking for at Hampshire. "It was this real hippie college that just wasn't a comfortable place." Things changed when Bua transferred to the Art Center College of Design in Pasadena, Calif. There, Bua found peace and ease as he was given the freedom to experiment and develop his artistic and intellectual sides. "I was still doing a lot of fundamentals, trying to find my style," he says, "But it was a time to search and play around with stuff." Once college ended, Bua began examining himself, searching for what would become "the style" that has made him so popular. "I didn't initially find my style. It wasn't until about six months after finishing college that I started doing my first pieces that were considered 'my style,'" he reminisces, "I thought, 'Wow, I'm painting this weird way, and I kinda like it.'" Bua didn't see an instant reaction to his initial work, however. "I was doing posters in '93, but I didn't know people were checking my style till (about) '98." "That's a long time." But once he got his Web site going around 2000, people really began checking Bua's work. His art drew the attention of MTV, which had Bua design the opening title sequence for "The Lyricist Lounge Show." Most recently, Detroit rap group Slum Village enlisted the help of Bua for the animation for their music video "Tainted." Bua even got the attention of Comedy Central, conceiving, creating and writing what would become the animated series "Urbania." But things didn't pan out with Bua's TV series. "It was (a) different agenda for Comedy Central. The new head who just came in cleared house. And unfortunately, or maybe fortunately, my show got cut." There is no bitterness in Bua's voice when he thinks about it. "It helped me in a way," he begins. "I just learned so much. The reflection is a learning journey. At the time it was horrible, but in retrospect it was amazing." Three years ago, Bua became a teacher at USC, which has been a revolutionary experience for him. "Teaching is incredibly rewarding. It is such a dichotomy of emotions for me. But while I get to take a journey with my students, and it makes me feel better as an artist, it is really more about them than about me." This brings us to the present-day Justin Bua. His artwork has amazed crowds, especially college kids. Bua adds, "I think that no one speaks to the youth so much, and I think my work does. I'm relatively young. I think people feel it- and, I can paint. I have skills. I think there is a kind of respect there." And for all the college kids out there, Bua has something special planned. He will be releasing a limited edition P.F. Flyer shoe that he has customized in three different styles: "The Baller," "The Boombox" and "The DJ." There are only 1,000 in existence, all of which Bua is extremely proud of. "I think the whole process was real inspirational. I feel kind of restricted sometimes on the canvas, but this is a shoe. It's a whole new design." The P.F. Flyer shoes will only be sold on select days. The shoes can be bought at Sportie LA on Melrose Avenue on May 27 from 8 p.m. to midnight. On May 28, from 4 p.m. to 7 p.m. the sneakers can be found at Fred Segal in Santa Monica. But for fans who can't wait that long to holla at Bua, on April 28, in conjunction with Hip-Hop Congress at USC, Bua will be giving a special talk in Taper Hall room 208 from 8 p.m. to 9 p.m.
Bua will be answering questions and unveiling a new surprise collection of his work. Bua is also working on a book, which will be available in the near future, and there is also talk of a movie. "There are a lot of things going on right now," Bua says, "and I am definitely enjoying it."